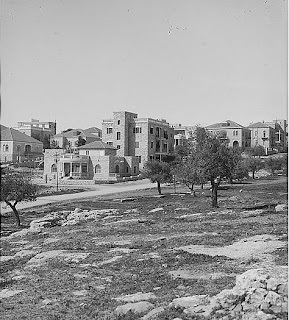 Some Jerusalemites will recognize the houses and street in this American Colony photo taken about 1930. The caption reads, "Newer Jerusalem suburbs, Talbieh, a Christian Arab community." The street back then was called Emir Abdullah Road. The neighborhood is adjacent to the Jewish neighborhood of Rehavia. After World War I, the land was sold by the Greek Patriarch to Arab Christians who built homes. British Mandate maps from the 1940s show approximately 90 homes, some residences for foreign consuls. In the 1930s several Jewish families also moved into the neighborhood. After the 1947 UN Partition vote, Arab and Jewish tensions grew. Residents in the Arab and Jewish enclaves in each other's areas left, many expecting to eventually return. When the British departed Palestine in May 1948, even some of the Talbieh Arabs who wanted to stay were under pressure and threats by both Arab and Jewish militias to leave. One wealthy Arab Christian "received threats from people in the Old City that his family would be murdered because he had decided to stay in Talbieh, because his presence there showed that it was possible to live together with the Jews," one Jewish old-time Jerusalemite related. stories added. Note the double porch on the second building. 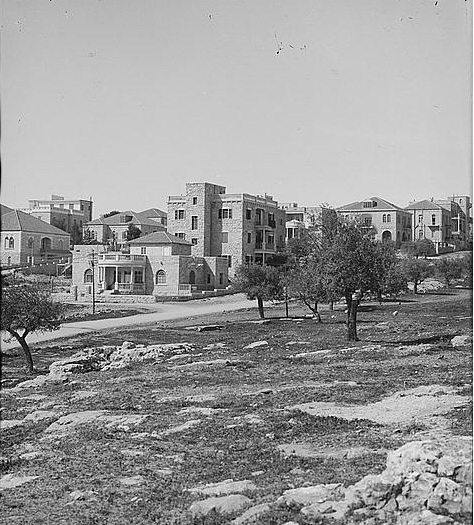 Jews who were expelled from their neighborhoods during the fighting were often resettled in the former Arab neighborhoods of Jerusalem. 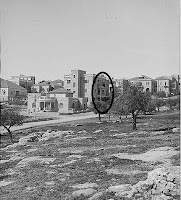 So where is this block of houses in Talbieh? Emir Abdullah Street is now called Jabotinsky Street. The first house in the 80-year-old picture is across the street from the Inbal Hotel. The one story structure had an additional three floors added to it. If there are any doubts about the location of the buildings and street, note the double porch on the adjacent building.